Looking for unusual and fun-filled activities to do in Rome? Then you’ve gotten to the right place. Rome is a city filled with historical monuments and buildings to visit and see. Even though people think Rome is a romantic place to visit, but we are here to give you the hidden unusual activities you can do in Rome, some place are not hidden to visitors and the world at large but there are some hidden fun-filled activities to do in these places. Join us as we take you down our list of 15 Unusual and Fun-Filled Activities to do in Rome. First on our list is wild and fun-filled as you get to see ghosts! Oops!! Going with a babe holding your hands in fear of getting scared when a ghost appear is romantic enough to make you love the Eternal City as it is called. One of the most-to-go place to see a ghost is the Ponte Sisto. The Ponte Sisto is Rome’s most romantic bridge but if you visit at sunrise local legends says you’ll see a ghost carriage charging towards you – the so- called female pope trying once again to flee the city with the church’s gold. It is also a charming old pedestrian bridge across the Tiber, it offers nice views of St. Peter’s Basilica as well as romantic sunset views. It takes only the brave and lion-hearted guys and gals to take a tour to this bridge at the time of the day when the ghost will appear. One of the Interesting and Fun-filled place you must visit as a cat-lover is the Romeow. Romeow is a cat café which not only has cats to cuddle but also amazing food. The concept adopted from Japan and started by Valentina and Maurizio: a couple with similar loves in life (that is for cat). You eat and dine in the company of the six adorable cats wandering freely on-site using napping on armrests or purring past your legs (isn’t that amazing?). 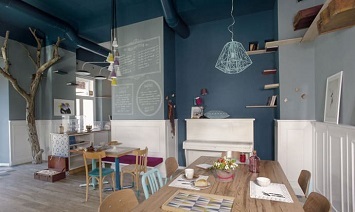 Romeow Cat bistro is a place where you must not miss on your visit to Rome. Apart from the amazing scene of cats it provides when you eat and drink, the bistro offers an entirely vegan menu, artisan beers and organic wines. Not yet over on our list for Cat-Lovers, visit the Torre Argentina Cat Sanctuary which serves as a home for over 27,000 colonies of cats (OMG!). After the evacuation of the temple ruins in 1929, feral cats moved into the area. An Actor named Antonio Crast found the old warehouse where archeologists in the 20s kept their tools, it was there he began feeding the cats. And since then, the shelter has grown with volunteers coming every day of the week to feed, care for and vaccinate the cats. So that means when going for a visit to this Cat sanctuary, you must go with food for cats, be ready to care for them and be ready to have fun taking pictures with the cats. One of the fun-filled things we learnt during our nursery school days is the diagram of a Vespa and the thoughts of seeing and driving it fills our mind. 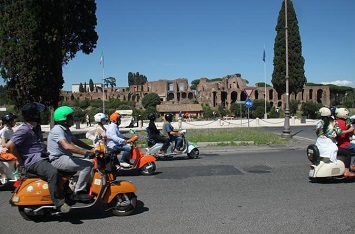 How about you fulfilling your dream of riding a Vespa along Rome Streets? Even if you are not experienced driving the amazing old ride, then you will be provided with a driver. You just sit down at the back with your helmet on your head and enjoy the full-day fun of roaming about the street on a Vespa. (A) Roma by Vespa:- Address: Via dei Mille, 8, 00185 Roma RM, Italy. Phone: +39 380 643 2278. (B) Colossseum Motorcycle Center:- Address: Via de’ SS. Quattro, 46, 00184 Roma RM, Italy. Hours: 9AM. Phone: +39 06 7045 1069. 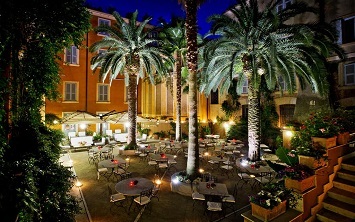 Address:Via dei Mille, 8, 00185 Roma RM, Italy. Romans catch fun when they watch their home based team play in international matches. Join them to shout and cheer as they watch their players roll the ball round the pitch. Here we have two options for you, it is either you go to the AS Roma Stadium (Stadio Olimpico, the main and largest sport facility in Rome, Italy) to watch live or you join the locals in a bar with a drink in hand to cheer. Going to the AS Roma Stadium is the most fun-filled, because you will have the privilege to see the match live and see the passion on the face of the roman players. Likewise seeing it in a bar also is full of fun because you mix with locals and also watch in a relaxed and comfortable way. Visiting a city without viewing the city as a whole on one of the city’s viewpoint means your journey there is a scam. 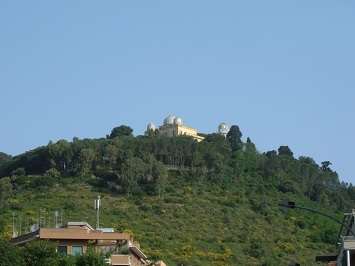 Monte Mario is the highest hill in Rome, Italy and it provides a panoramic view of the city at large. Apart from being a beautiful view point, it also contain a natural reserve which introduces a charming frame of green, made of history and culture from centuries to centuries. The reserve with 238 hectares provides a good view point for observing the sea and it also hosts the Osservatorio Astronomico. Historical Villas such as Villa Mazzanti and Villa Mellini are also found on this mountain. Going to this hill is equivalent to having a double blessed fun-filled journey to this historical city called ROME. 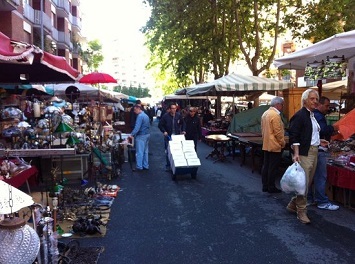 One of the unusual things to do in Rome is to visit the largest second-hand market in Rome. The Porta Portese provides a lot of second-hand clothes, souvenirs and so on just on every Sunday. Porta Portese is an ancient city gate located at the end of Via Portuense, it is advisable to go early because it is always super crowded on a sunny day. It is always good to bargain with locals and foreign people in a strange land, buy their things that would make you always remember the times you spent in that city. Don’t forget to take pics with people you bought goods from, it is always fun-filled. This might be creepy and not fun but it is an unusual activity to do in Rome. Rome is filled with historical places plus stories and visiting the crypt of skulls in Santa Maria della Concezione dei Cappuccini Church is one of the historical places you must visit in Rome. 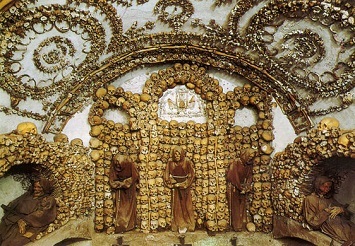 There are more than 3,700 capuchin friars’ bodies remaining, it is a total different experience as you go from one room to another with skulls and bone chandeliers scattered on the floor. There are six total rooms in the crypt, five featuring a unique display of human bones believed to have been taken from the bodies of friars who had died between 1528 and 1870. Note: For Sensitive people, we don’t recommend it. 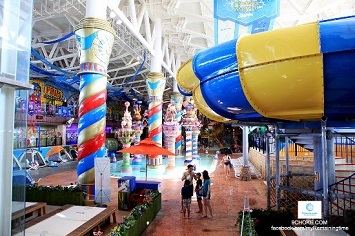 One of the fun-filled things to do in Rome is a cool refresh at a water park. Rome in summer can be supper hot, so visiting Rome during summer periods might not be friendly because heat would just be too much. But then you can spice it up with a constant summer refresh in any of the water parks around you (and you can check the list down below). Don’t go alone ooo, go with someone like your friends, lover, relatives because refreshing with people makes the activity lively and fun-filled. But we bring to you some beautiful and best water parks in the city. Address: Vicolo del casale Lumbroso, 200, 00166 Roma RM, Italy. Address: Castello Di Lunghezza, via dellaa Tenuta del cavaliere, 230, 00132 Roma Rm, Italy. Hours: 7AM Mon. Address: Via Tarquinio Collatino 56/58, 00175 Roma RM, Italy. Address: via Isacco Newton 43, 0051 Roma RM, Italy. Address:Vicolo del casale Lumbroso, 200, 00166 Roma RM, Italy. Spend a day at the Rome’s Villa Borghese, it is always fun-filled to visit this landscape garden that contains a vast number of buildings, museums and attractions. It is the third largest public park in Rome after the ones of the Villa Doria Pamphili and Villa Ada. Even though it is ranked third, there are features and historical places embedded in it. Opening times: Tues. – Sun 9:00 – 19:00 (Monday: Closed). Contact: +39 06 841 3979. Opening times: Tues – Sun 10.00 – 18.00 (Monday Closed). Opening times: 9:30 – 18:00. (D) Passeggiata del Pincio. Casina di Raffaello (a toy library for children):-. Give your kids exciting views of toys and you might as well buy books and toys for them. This also made our list of the Fun-Filled activities to do in Rome. 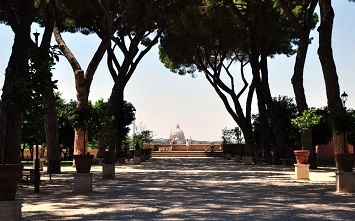 The Orange Garden of about 7800 square meters is located on the Aventine hill. The garden was designed in 1932 by Raffaele De Vico and the architectural design was never changed up to today. Apart from the beautiful Orange garden, the hill also give an amazing view of the city as you stand among the orange trees. Moreover, it is a great place to have a picnic among the orange trees. So don’t miss out, take some pics as you have a fun-filled day on Aventine Hill. Many people don’t know there is an Egyptian style pyramid, the Pyramid of Cestius in Rome. In the heart of Rome lies this 200 years old Pyramid which was built as a tomb for Gaius Cestius, a member of the Epulones religious corporation. 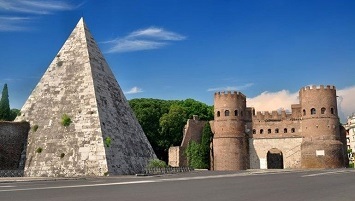 It is an ancient pyramid near the Porta San Paolo and the Protestant Cemetery and it is the first and only of its kind in Rome. So you have read and learnt about this stand-out monument in Rome, you can now plan your schedule to go there on your visit to Rome. This Place is full of fun-filled sightseeing activities. 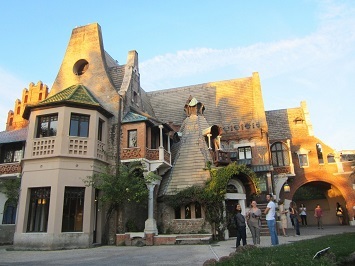 Just get yourself mesmerized with the beautiful and Unusual Architecture buildings at the House of Owls. Within the grounds of one of Rome’s most beautiful neo-classical masterpiece, the Villa Torlonia (the residence of Prince Giovanni Torlonia) lies a magnificent piece of surreal architecture that seems in parts of the place, but entirely perfect against the green and wooded parkland in which it sits. A visit when the sun goes down suites this interesting place. You can’t afford to miss the sights of crafts, artist’s work and terracotta works in the building as you roam around the roam. Mr. and Mrs. Food Lovers, we got you an amazing and fun-filled activity in Rome. 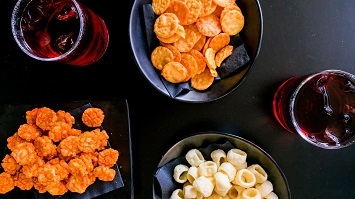 An Aperitivo in Rome consists a free dish (or even buffet) with a drink during the evening. It is always in the evening around 18:00, behave like the locals and join them in an Aperitivo activity. Aperitivo is often called “American Happy Hour” in America. The Latin word ‘aperitivi’ means ‘opener’, signifying that it was to open a meal. This simple act evolved and encompass a couple of hours in Italy generally between 6pm to 9pm – when Italians meet to relax over a glass of wine or a light cocktail and finger foods. One of the most local and famous place for an Aperitivo is Freni e Frizoni. Address:Via del Politeama, 4, 00153 Roma RM, Italy. And lastly, do you know how to throw beef words or you want to learn or you know the reply to bad words or you want to learn how to ignore bad words? 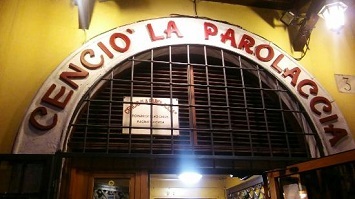 Then La Parolaccia is the answer, it is a restaurant in Rome where waiters are trained to bring you the dishes loaded of good food and bad words. Don’t take it personally! It is just a show where they use abusive language. And the best part, you can also use as many as you want. The restaurant will serve as a good place to check out after a bad day?